Over the course of 2007, your editor set foot in 20 of our 50 states, visiting broadcast facilities all along the way. And now that the season of travel has ended, it's time to settle back and begin recapping some of what we saw as we criscrossed this land of ours. This week, we continue our recap of what we'll call "Medium Trip 2007," a 10-day family journey that began and ended in Chicago, taking in much of Iowa and a little of eastern Nebraska along the way, and in the process revisiting for the first time some of the territory from our original Big Trip back in 2001. 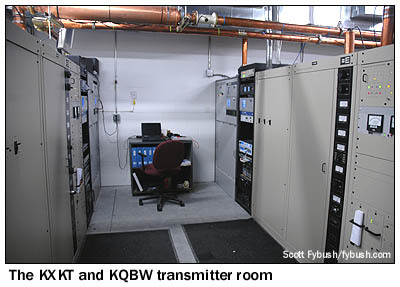 When we left off in our last installment, we were heading down the stairs of the venerable studio facility at 5010 Underwood in Omaha in the company of Clear Channel chief engineer Greg Gade, bound for a site we'd seen several times from the outside but never from within: the 50-kilowatt KFAB (1110) facility on Capehart Road near Papillion, Nebraska, a dozen miles or so south of downtown Omaha in an area that's fast transforming from rural to suburbia. 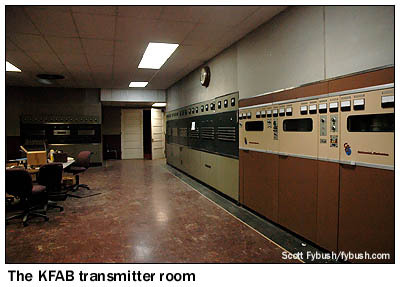 Like the KFAB studios on Underwood, the transmitter site dates back to the station's 1948 move from Lincoln, a move that ended a curious chapter in radio engineering history. At its previous home in Lincoln, KFAB had operated on 770 and then 780, in an unusual shared-time arrangement with Chicago's co-channel WBBM. 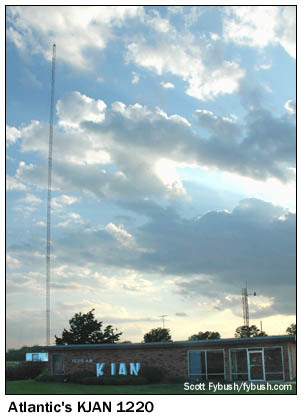 Beginning in 1939, the stations synchronized their carrier frequencies via a telephone line that ran from the WBBM transmitter outside Chicago to the KFAB site near Lincoln, thus providing a nearly coast-to-coast CBS signal on that frequency. It was an interesting experiment, but KFAB sought its own destiny independent of Chicago, and in 1945 it was granted a CP to make the 45-mile move east to Omaha, changing frequency to 1110 in a trade with WJAG up in Norfolk, Nebraska. 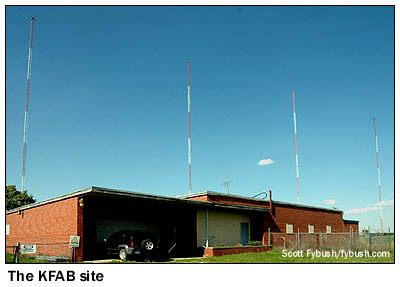 WJAG moved to 780 as a daytimer, and KFAB became a Class I-B 50 kW signal on 1110, non-directional by day and directional at night, using three towers to create a deep null to the east-southeast, protecting co-channel WBT in Charlotte, which went from fulltime non-directional operation to DA-N at the same time. We enter the transmitter building through the old garage, now used for storage. There's a generator room in back, and a set of steps leading into the transmitter room itself, where there's a nifty array of transmitter history. On our right as we walk in from the garage is an exceedingly rare Westinghouse 5 kW transmitter, which Greg thinks was brought over here from Lincoln back in 1948. (In his spare time, he's working on restoring it for auxiliary use.) 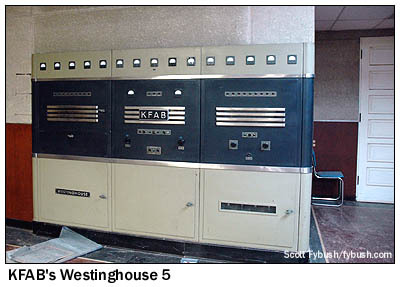 There's a Westinghouse 50HG, KFAB's original 50 kW transmitter at this site, no longer operational but still very pretty to look at, and still containing the phasor cabinets for the station's nighttime signal, and a Continental 317C that's the auxiliary transmitter. Along the other long wall of the transmitter room, facing the front of the building, are several small rooms that were once used for living quarters; one appears to have done some duty as an emergency studio, too. One more note: when we first saw this site in 2001, we mistakenly identified it as a "four-tower array," a mistake that's easy to make, inasmuch as there are in fact four towers in the array. But the easternmost tower (at right in the photo at top) isn't part of the 1110 array, and never has been: it went up here for KFAB-FM (99.9), today's KGOR, and can still be used as an emergency backup facility for the FM. And if the easternmost tower in the actual AM array (third from left in the photo) looks a little newer than the others, it's no accident: the old self-supporter that used to be there was replaced in 2005 with a new guyed tower, allowing many DXers in the east to log KFAB in the meantime, when it was operating at reduced power in non-directional mode at night. "Want to go see the FMs?," Greg asks as we leave the AM site, and the answer is an immediate yes. Clear Channel owns four FMs in the Omaha market, and they're all located at "Crown Point," on the tall TV towers that dominate the northwest Omaha skyline in an impressive line along North 72nd Street: class C3 KHUS (93.3 Bennington) on the 1152-foot Journal Broadcast tower that went up in the nineties on the south end of the farm; KGOR on the 1345-foot KMTV (Channel 3) tower, which is also home to an auxiliary facility for KXKT (103.7 Glenwood IA); and a new combined facility for KQBW (96.1 Omaha) and KXKT on the newest tower in the farm, the 1365-foot tower that KETV (Channel 7) built in 2004 after its original tower collapsed during a DTV antenna replacement project in July 2003. 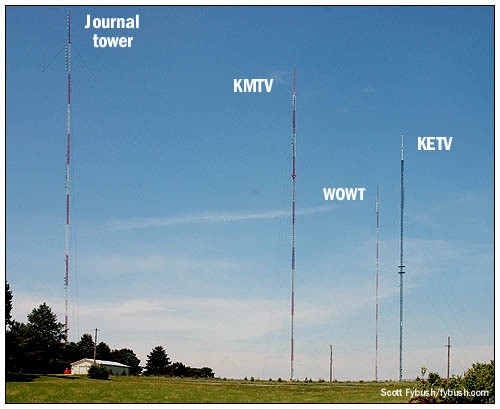 With all that new vertical real estate beneath the stacked analog/digital antennas on the fat new KETV tower, Clear Channel was able to start from a blank slate, more or less, on its design for the combined 96.1/103.7 transmission facility. 103.7's history is perhaps even more tangled: it began life as KJAN-FM, licensed to Atlantic, Iowa, 50 miles or so to the east. 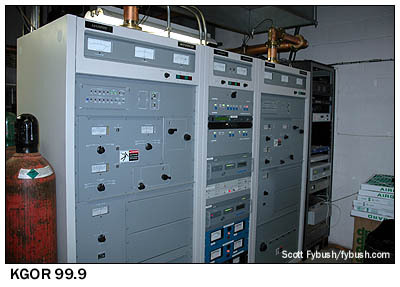 In 1992, while still licensed to Atlantic, 103.7 turned on a high-powered (17 kW) on-channel booster on the KMTV tower, instantly transforming itself from a rimshot into a fairly convincing full-market signal. 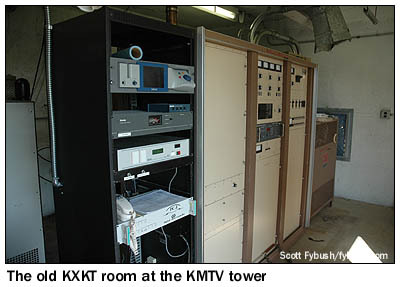 That facility, in a small concrete-block bunker at the base of the KMTV tower, remains in use as the auxiliary site for 103.7. 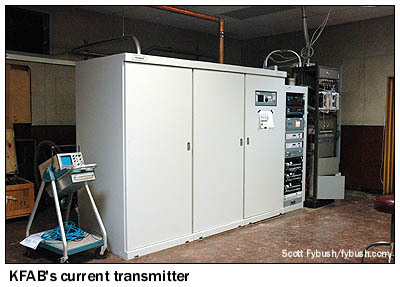 Meanwhile, though, 103.7 was relicensed to Glenwood, Iowa, just across the Missouri River from Omaha, enabling Clear Channel to shut down the old "main" transmitter site over in Iowa and the vertical-only Omaha booster, replacing both with a C0 signal from the WOWT tower (using, if memory serves, that Continental transmitter that's now at the aux site), and then with the new 100 kW/331 m class C0 signal from the KETV tower at Crown Point. Clear Channel picked BE analog and HD transmitters for the new 96.1/103.7 setup, feeding an ERI combiner and an ERI 10-bay antenna up near the top of the KETV tower, and the result is a nice, potent signal that blankets the market and then some. As for KGOR, it's grandfathered at a bit above class C0 maximum, running 110 kW (115 kW, with beam tilt)/370m from a separate building at the KMTV site. 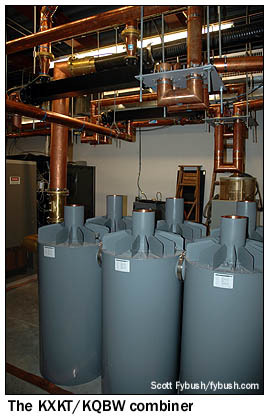 This one's a Harris installation, with a pair of HT25CD transmitters combined to create something called an "HTD50." (We don't often see that kind of RF back east! ), and a separate Harris HD installation. In recent years, the Crown Point tower farm has sprouted its first studio building, as what was once the western edge of the city has become fairly dense suburbia, complete with a shopping plaza across the street. 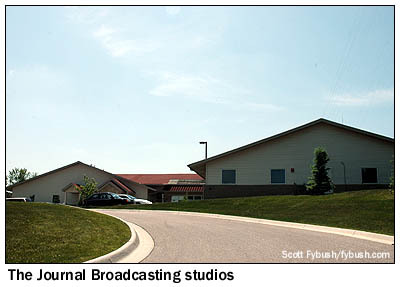 Journal Broadcasting consolidated here earlier in the decade, building a studio complex near its tower on the south end of the farm to house a cluster that currently includes sports talker KXSP (the old WOW on 590), KEZO-FM (92.3), KQCH (94.1), KSRZ (104.5) and KKCD (105.9), the latter four all transmitting from the tower right out back. After a weekend of family events, we head east again on Sunday evening, taking advantage of the long spring evenings out here at the edge of the Central Time Zone to take in the stations of Atlantic, Iowa on our way to Des Moines. KJAN-FM may have departed for Omaha, but its old sister station is still here, right off the main drag heading north from downtown. KJAN (1220) runs only 178 watts by day, 62 watts at night from its single tower (which isn't bent - that's just optical distortion), but with the amazing ground conductivity here, it gets out. Believe it or not, this little AM is running a local classical-music show this Sunday evening. 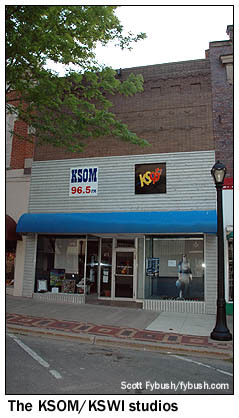 Downtown, we find the studios of Atlantic's two FM stations, classic hits KSWI (95.7 Atlantic) and country KSOM (96.5 Audubon); they share a tower as well, out to the east of town off Iowa 83 near Wiota, Iowa. That's KSOM's 100 kW C1 signal at the top, KSWI's 20 kW C3 directional down below. From here, we're off to Iowa's capital city and a one-station tour agenda on Monday morning. WHOever could it be? Join us again next week for the (sure to be surprising) answer - and check in over at our partner site Tophour.com next Wednesday (Nov. 28) to hear more Omaha IDs and a bunch from the Atlantic area as well! Thanks to Greg Gade for the tours! Tower Site Calendar 2008 is here! Visit the Fybush.com Store now and get your calendar now!